As part of its upcoming Victorian, Pre-Raphaelite & British Impressionist Art sale on 8 July, Christie’s London are auctioning a series of important maritime fine art works which are perfect for a superyacht art gallery. 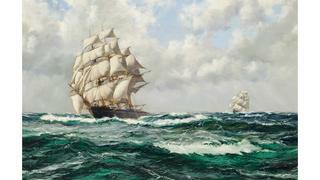 Of particular interest to those with a fondness for nautical history, the works include depictions for original J Class yacht Endeavour, Lord Colville’s schooner Volage and a number of impressive military vessels. Click through to see our pick of the best. Finished shortly before John Atkinson Grimshaw’s death in 1893, Starboard Light is often seen as the culmination of the artist’s myriad experiments on the effects of light. 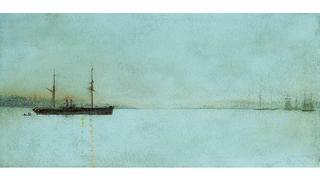 Highly influenced by the Nocturne series of his friend and neighbour James McNeil Whistler, this atmospheric twilight scene of a ship against the horizon is a quintessential piece by one of Britain’s great painters. 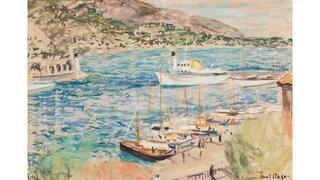 If you’re looking for some art to add a little colour to your yacht for Mediterranean charters then Paul Maze’s bright depiction of a steam yacht entering (a very small and quiet) Monte Carlo harbour could be just the thing. Maze spent much of his career painting maritime and coastal scenes around Europe and is considered a leading figure in the genre. One of the great sailing injustices, the magnificent galleon Chrysolite has faded into relative obscurity thanks to a series of skippers who never managed to make the most of her brilliant potential. Used to transport tea between China, the UK and Americas throughout her life, the British clipper was sailed first under Captain Enright and then Captain Alexander McLelland before coming to a sad end when she was wrecked during a hurricane off Mauritius in 1873. 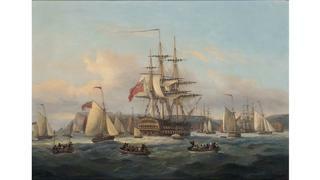 The full name of this sumptuous work by Samuel Scott – A large first rate, though to the Royal William (formerly the Prince), lying at her anchorage, surrounded by other vessels and preparing to receive a distinguished – possibly royal – visitor – more than adequately explains the scene unfolding in this beautiful depiction of naval history. 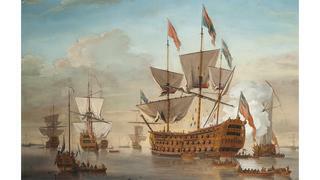 Scott was one of only two principal marine painters of his time and completed frequent commissions from the East India Company and Admiral Vernon, alongside a large body of naval warfare works. Ironically he also suffered severe sea-sickness and so ventured on very few sea voyages himself. An important piece for naval warfare historians, this work by Thomas Luny depicts the vessel to whose captain Emperor Napoleon surrendered after the battle of Waterloo, subsequently carrying him to exile. Napoleon was believed to be on the ship when Luny painted it and his representation of the crowds of gathering in any vessel they could to catch a glimpse of the defeated emperor has long seen this considered his finest work. Between his duties as chairman of the Great Northern Railway Company, Lord Chamberlain, Scottish Representative Peer and president of the Honourable Artillery Company, British nobleman Lord Charles John Colville was also a keen yachtsman. 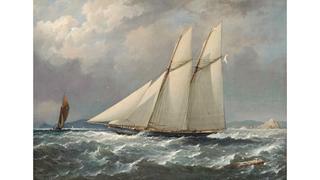 Undoubtedly the finest of his three yachts was the schooner Volage, captured here by Richard Brydges Beechey flying the colours of the Royal Yacht Squadron which, as a Cowes resident, Colville was elected to in 1853. Dark and dramatic, this thrilling piece by Thomas Luny eschews the sparkling blues and clear skies of the marine genre for the fearful atmosphere of war. 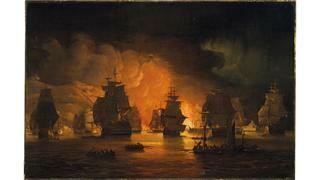 The work captures the moment Admiral Lord Exmouth’s squadron finally took a stand against the pirates that had been terrorising the British colonies on the North African seaboard. 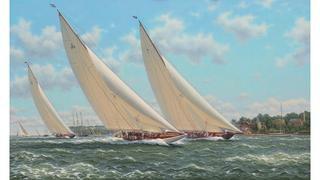 A must for anyone with a J Class yacht, this bright and lively works by Richard M. Firth shows three of the original and most revered J Class sailing yachts – Yankee, Britannia and Endeavour – racing in the Solent off the Royal Yacht Squadron in Cowes in 1935. Thought of as the golden age of racing, this particular regatta took place to commemorate King George V’s Silver Jubilee year and adding particular value for anyone with a connection to the British racing scene. One of the few late 20th century artists to feature in the sale, Jamie Medlin’s highly realistic renderings of everyday naval scenes have a stunning pastoral quality. 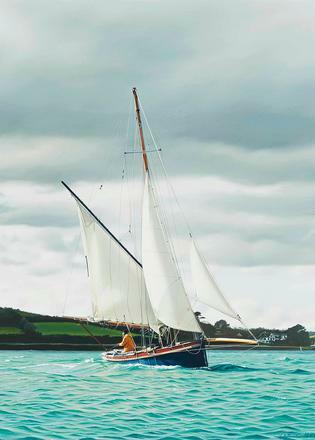 His depiction of the Falmouth oyster dredgers is particularly poignant as they are the last working sail-powered fishing vessels in Europe, having been restricted to sails and oars by local by-laws in order to protect the ecology of the river bed.